Prior to March 7, 1810: In late February or early March of 1810, the trustees of the Ebenezer Methodist Church of Southwark considered the purchase of the Queen Street lot for use as a burial ground. The asking price was $1,700. They instead purchased a lot on Christian Street. (The History of Ebenezer M.E. Church of Southwark, Philadelphia (Philadelphia: Lippincott, 1890, 62). 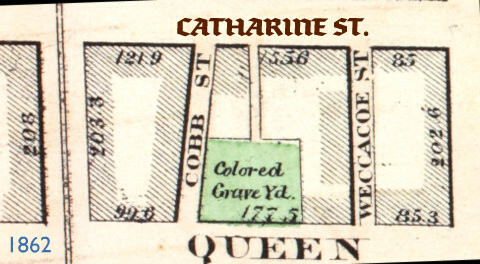 28 April 1810: The parcel of ground bordered by the 400 block of Queen Street to the south, the 400 block of Catharine Street to the north, the 800 block of Leithgow Street (formerly Weccacoe Street) to the east and the 800 block of Lawrence Street (formerly Cobb Street) to the west in the Queen’s Village section of Philadelphia is purchased by Reverend Richard Allen and the Trustees of Mother Bethel African Methodist Episcopal (AME) Church on April 28, 1810 for $1,600. 1819: A letter to The Philadelphia Register by a white man describes a funeral procession and burial at BBG of an unnamed Black man who was employed as a woodsawyer. The procession was led by his professional society. “The society walked by the grave, and were followed by many whose dress was comfortable, and whose appearance was neat. When we entered the burial ground of Bethel church, they commenced singing a hymn appropriate to the occasion, which was continued round the grave, and had a very solemn and impressive effect. When it was finished the preacher (a “coloured” man) delivered a discourse. . . . One sentence I particularly remember: “The greatest text is an open sepulcher, and the loudest voice that can be addressed to you will soon be heard on the boards of the coffin. (The Philadelphia Register and National Recorder, vol. 1; Jan to June, 1819, p. 84-85. 10 Nov 1847: The Philadelphia Board of Health notifies Bethel Church officials that the BBG is a public nuisance following complaints by neighbors and an inspection by Board members. “You are hereby notified, that in all future interments made therein each body shall be deposited in the grave six feet in depth, and filled up with earth to a level with the proper surface of the ground; and that nobody shall be kept upon any part of the said grounds, or in any place appertinent and thereto, for a longer period than two hours previous to it being interred as above directed.” Philadelphia Board of Health Minutes for November 10, 1847. 14 Oct 1849: Ignatius Beck is buried at BBG; as an enslaved laborer worked on the construction of the U.S. Capitol Building. 6 July 1872: An article appears in The Christian Recorder by the editor Bishop Benjamin Tucker Tanner calling attention to the shameful condition of “the burial ground of Bethel Church.” The article exclaimed “. . . is there no more precious dust” than those who are buried there. These men and women, these “heroes and heroines” are responsible for what Mother Bethel is today. + “Twenty-five years have passed since the last burial (1864). 24 May 1889: The Select Council of the City of Philadelphia transfers $10,000 from the Department of Public Safety for the purchase and improvement of Weccacoe Square, to the department of Public Works for the repaving of Queen Street between 4th and 5th streets. That Item 41, Section 8, of the Ordinance approved December 24, 1888, making an appropriation for 1889 to the Department of Public Safety (Bureau of City Property) , be amended by striking out the words “and improvement” as that the item will read “for the purchase of Weccacoe Square,” ten thousand ($10,000) dollars. Approved this fourteenth day of November, A.D. 1889, Edwin H. Fitler, Mayor of Philadelphia.” The Philadelphia Inquirer, Nov 25, 1889, p. 5. 19 Dec 1889: The Philadelphia Ledger reports that the trustees of Bethel African Methodist Episcopal Church received the purchase money for Weccacoe Square. The Square is the first plot actually acquired as a result of the “Small Park” movement. 27 Dec 1889: Sale agreement signed by Mother Bethel trustees selling the BBG for $10,000 to the City of Philadelphia. 20 Aug 1890: “Contractor Filbert is getting Weccacoe Square, Queen St. east of Fifth, ready for Promenaders. The site is that of an abandoned burial ground for colored people.” The Philadelphia Inquirer, Aug 20, 1890, p.1. Arbor Day was observed in the Park in the spring of 1901 with the planting of saplings and again in 1902. Perhaps a longer lasting effect of the movement was the mandatory establishment of an accompanying playground attached to the gardens. The rudimentary playground at Weccacoe took up one third of the entire lot and included softball (there was not enough room for hardball), basketball, ring toss and a punching bag. The average attendance in the playground was a reported average of 100 children a day. 3 December 1921: The Philadelphia Tribune article recounts BBG history: On April 28, 1810, Matthew and Hannah Waring sell to Bethel for $1,600 a lot on the north side of Queen Street, between 4th and 5th Streets, in the District of Southwark with a frontage on Queen Street of one hundred and twenty-one feet and two inches, extending in depth northward one hundred and three feet. Lot was part of a larger plot previously owned by James Currie of Richmond Va., a physician. Sixty years after the purchase of the ground that was long used by Bethel as a burial ground, the Trustees of Bethel rented the burial ground out on the first of January, 1869 to Barnabas H. Barlot, a sugar refiner, for 10 years at $500 per year; the lot to be used for the storage of wagons and drays. In June of 1873, Bartol sought to be released from his agreement. The Bethel Trustees did so on June 6, 1873 for a cash settlement and the erection of a good fence around the lot. Subsequently, the lot was sold to the city of Philadelphia and is now used as a public square. Weccacoe Playground was one of nine city playgrounds under the control of a quasi-governmental agency called the Philadelphia Playground Association that relinquished oversight in 1910 to the Bureau of City Properties which in turn transferred responsibility to the Board of Recreation in 1912. The park system created a valuable amount of political patronage jobs that resulted in a tug of war between city agencies. 14 June 2013: The Philadelphia Historical Commission votes unanimously to designate the property at 405-25 Queen Street as “historic” and subsequently will list it on the Philadelphia Register of Historic Places. 2 June 2015: The full board of the Pennsylvania Historical and Museum Commission votes unanimously to approve the application for National Register status and forward it to the National Park Service for their consideration. Philadelphia Inquirer, 24 June 1889. 2 Ibid, 20 Aug 1890. 3 Ibid, 12 Apr 1901 and 5 Apr 1902. 4 John W. Harshberger, PhD, The Botanists of Philadelphia and Their Work, 1899, p. 252-253. Available at Google Books; The Gardeners’ Chronicle: A Weekly Illustrated Journal of Horticulture and Allied Subjects, vol. v, 3rd series, Jan to June, 1889, London, p. 529. Available at Google Books; also see, Philadelphia Inquirer, 9 June 1912; NYT, 1 Sept 1895; Stephanie G. Oberle, The Influence of Thomas Meeham. The above photograph was published in Appleton’s Magazine, vol. 5, January-June 1905. 5 The Nature-Study Review, vol. 1, 1905, p.34; Published by the U.S. Bureau of Education and available through Google Books; James Ralph Jewell, Agricultural Education including Nature Study and School Gardens, Dept. of the Interior, Bureau of Education, whole no., 368, bulletin no. 2, 1907, p. 212-217 and available through Google Books; U.S. Dept. of Agriculture, Annual Report of the Office of Experiment Stations for the year ended June 30, 1905, printed 1906, p. 356-7; The Booklovers Magazine (later “Appleton’s Magazine”), vol. 5, Jan-June, 1905, p. 468-478 and available through Google Books; Philadelphia Inquirer articles on the Park’s gardening era include: 25 Feb 1904, 9 Mar 1904, 17 Apr 1904, 24 May 1904, 20 Oct 1904 and 23 Dec 1904. 6 The Booklovers Magazine, p. 473; Annual Report of the Mayor of Philadelphia . . .for the Year ending 31 Dec 1912, vol. 1, 1913, p. 706. Both are available through Google Books. Note: For remarkable photographs of the plot before and after the garden was planted see The Playground, a monthly journal published by The Playground Association of America, no. 15, June 1908, p. 2-6. Available at Google Books. 7 Philadelphia Inquirer, 29 July 1905, 19 June 1910, 29 June 1911, 2 July 1911, 16 June 1912, 7 June 1914, 6 June 1915, 4 June 1916, 27 May 1917 and 5 July 1917; the above photograph is from The Philadelphia Ledger, 1 Feb 1915, p.1.